Let’s admit it. We’ve also been taken in by those fluffy, purring, stubborn balls of fur and can’t keep ourselves from saying “Awww” now and then when watching a cat video – especially when the kitten’s having a nightmare and its mama hugs it so adorably. But the online trend is anything but new. For years now, social networks have been crawling with cute kitties chasing laser pointers, falling off treadmills, detesting water, doing spectacular somersaults, or running into windows. With all those performances, cat videos reach audiences that the latest pair of sneakers or this year’s car model could only dream of. And yet netizens are far from having had enough. Cat videos are still incredibly current. So when yet another super-cute cat video made the rounds of our inboxes and we noticed World Cat Day (today!) approaching in the calendar, we began to ask ourselves: Does the cat phenomenon have an explanation? We’ve mentioned it already. “Awww” is probably the most common comment on a cat video – followed by uncontrollable laughter. And sometimes, when the cat gets into a tricky situation – you even feel a little bad for it. 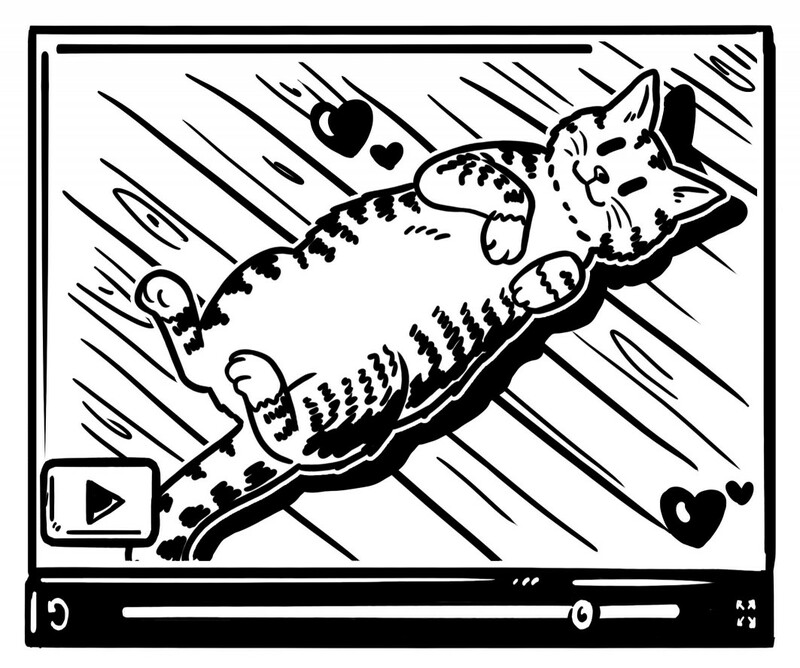 Cat videos inspire emotions, causing us to internalize what we’ve seen much more strongly and store it in our brains. So that’s why explainer videos should provoke emotions through strong storytelling! Granted, we often don’t understand felines’ wacky behaviour in those videos. And yet in some situations, the cat seems to be our mirror image. Take “Grumpy Cat” on a Monday morning. Or the cat who’s having a bad day and gets pounced on by a mouse. As simpleshow co-founder Jens pointed out, identification is an important instrument for a good explainer video. That’s how the viewer realizes it’s about her, that her problem or question has been understood and this video is explaining the solution. That, in turn, draws attention and builds trust. Cats can keep surprising us – whether they suddenly climb a wall or talk to each other. In cat videos, something unexpected always attracts the viewer’s attention. And these days, when our attention spans are shorter than ever, it doesn’t hurt to keep the viewer guessing with a few surprises. Have you got all that down? Then we’re crossing our fingers that your explainer video catches up with the cat videos and will be conquering the web before you know it.